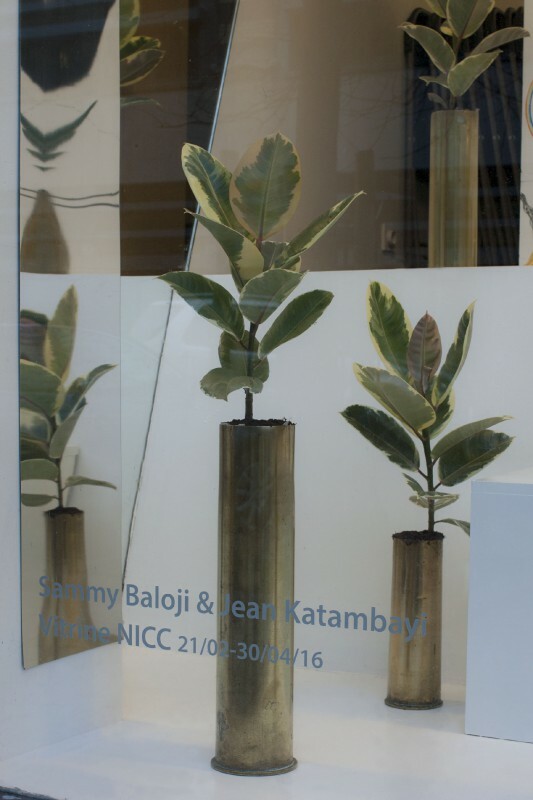 NICC proudly presents its new vitrine installation by renowned artists Sammy Baloji and Jean Katambayi, both of Congolese decent. 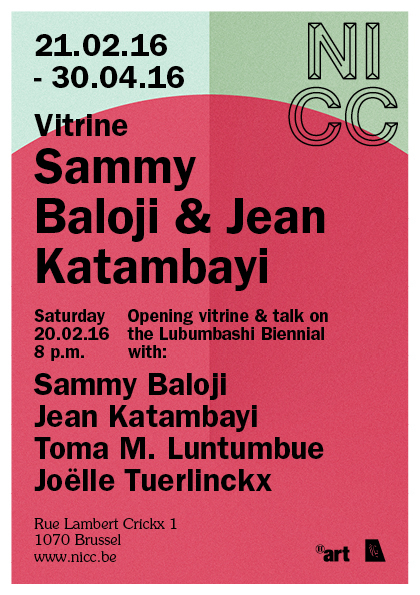 On the occasion of the vernissage, there will also be a panel talk on the Lubumbashi Biennale with its current artistic director and curator Toma M. Luntumbue and artists who participated in the Biennale: Sammy Baloji, Jean Katambayi and Joëlle Tuerlinckx. Drinks will be served. Sammy Baloji (1978) is a photographer born in Kinshasa. Baloji graduated in literature and humanities at the University of Lubumbashi. Upon graduation, he started working as a cartoonist, after which he got into photography and video. He made numerous documentaries about his own environment in the province of Katanga. 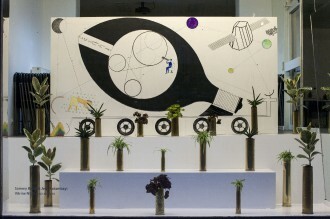 Recurring motifs in his work are ethnographic exploitation, architecture and urbanism. His work has been featured in important exhibitions such as ‘Hunting and Collecting’ (Mu.ZEE Ostend, solo show, 2014), Venice Biennale (Arsenale and Belgian Pavilion, 2015) and La Biennale de Lyon (2015). Later on this year, Sammy Baloji and Filip De Boeck will have an exhibition at WIELS. Jean Katambayi (1974) lives and works in Lubumbashi (DRC). Apart from being an artist, Katambayi is also passionate about technology, mechanics, geometry and electricity. His work combines influences from everyday life with his background as a electrician. His technological inventions are a quest for solutions in Congolese society. Katambayi’s has recently been shown at M HKA (Antwerp, 2015) and the Lubumbashi Biennale (2015). Later on this year, he will have a solo show at Trampoline gallery in Antwerp. 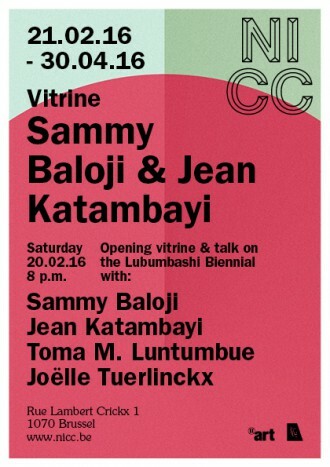 Katambayi is a current artist-in-residence at WIELS. Joëlle Tuerlinckx (1958) is a Brussels-born and – based artist whose work revolves around the understanding of space and time. Using a distilled artistic vocabulary, she revisits the formal heritage of the 20th century, examining the tension between sign and language through different materials. Tuerlinckx’s work has widely been shown on a national and international level, among others at S.M.A.K. (Ghent, 1999), Manifesta 3 (Ljubljana, 2000), Bonnefantenmuseum (Maastricht, 2001), Documenta 11 (Kassel, 2002), The Renaissance Society (Chicago, 2003), The Drawing Center (New York, 2006), MAMCO (Geneva, 2007) WIELS (Brussels, 2012), Haus der Kunst (München, 2013), Arnolfini (Bristol, 2013), and Lubumbashi Biennale (2015). Future exhibitions include Museum für Gegenwartskunst Basel (2016), Skulptur Projekte Münster (2017) and Dia Art Foundation (2017-18). Toma Muteba Luntumbue is an artist, art historian and curator. He has been appointed Artistic Director of Rencontres Picha, Biennale de Lubumbashi, 2015 (DRC). He teaches Art History at ERG, Ecole de Recherche Graphique and at Ecole nationale supérieure des arts visuels de La Cambre in Brussels. Curated exhibitions include the following : Ligablo at the Belgian Royal Library (Brussels, 2010-11), Transferts, Palais des Beaux-Arts, , (Brussels, 2003), Exitcongomuseum, Royal Museum of Central Africa (Tervuren, 2000-2001). His work has been included in numerous shows, among others at S.M.A.K. Ghent, M HKA Antwerp, MARTa Herford, Kunsthalle Budapest and Migros Museum für Gegenwartskunst in Zürich.